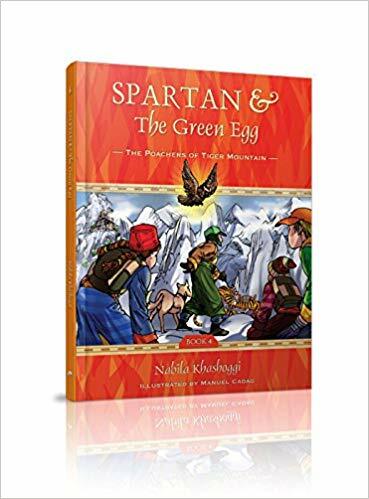 Spartan and friends travel to the Kingdom of Bhutan in Book 4 of Spartan and The Green Egg: The Poachers of Tiger Mountain. Spartan and friends travel to the Kingdom of Bhutan in Book 4, The Poachers of Tiger Mountain. The travelers arrive at a village hosting a lively archery tournament as part of a Bhutanese festival. They make new friends who invite them to join the feast and watch the performance. Soon the group discovers that poachers have killed off many of the tigers that used to thrive in Bhutan, and now only 2 cubs remain. They face their most challenging mission yet: to save man-eating tigers from armed poachers amidst freezing weather conditions in the Himalayan Mountains! Using a few extraterrestrial tools and assistance from their new Bhutanese friends, the group embarks on a very dangerous mission. Will they arrive too late to save the tigers? This children’s book follows the adventures of Spartan and his friends as they go on adventures and help the environment. This was my first time reading this series so I found it hard to understand a bit about the Green Egg so it would be a good idea to read the books in order. It wasn’t impossible because you quickly realize the Green Egg is similar to a time machine that takes them to the Kingdom of Bhutan. Here the group of heroes meet a brand new culture, make friends and join in on their celebrations. They soon come to realize that the tigers in this region are quickly becoming extinct due to poachers! A scenario that many of us understand and which is a great teaching opportunity for us as parents with our children. They set out to rescue two tiger cubs and bring them back to a special tiger reserve where they will be safe from humans and cages. The only problem? Not only are there poachers, they have to make friends with the dangerous tiger cubs! I was pleasantly surprised to see the book format was comic style. It helped to really draw you into the story and I know many kids like and appreciate the extra illustrations and fast pace of this style. I love how she touches on the topic that children can do anything and everything to help protect our animals and environment – while they may not be able to jump in a green egg – they are important members of our community and can make a huge impact. It is so important to empower youth to understand their potential and encourage them to be stewards of our home. We really enjoyed this book and the conversations it started at home. You can purchase a copy of this book on Amazon. Read more about the series on the Spartan and The Green Egg website. Born in the Mediterranean and raised in Europe, Nabila Khasoggi is the founder of NABILA K, a lifestyle line of luxury skin care, home ambiance and personal products. When her eldest was a toddler, she entertained him with made up stories of a boy who traveled the world in a live green egg that happened to be an alien from another planet. 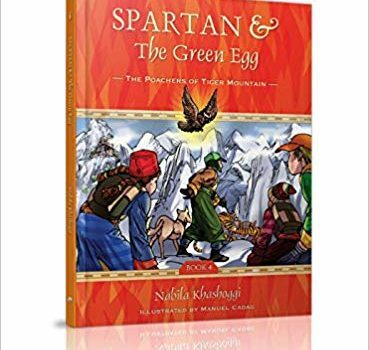 She turned the tales into a children’s graphic novel series, Spartan and the Green Egg, with the intention of introducing children to environmental and cultural themes. Part of the proceeds from the sales goes to The Children for Peace ONLUS, which is based in Italy – this organization helps young people worldwide living in challenging circumstances obtain their essential needs such as food, medical help and education. Nabila currently lives in New York and has two sons. This entry was posted in book review, review.